Natural Grocers has distinct advantages. And investors are starting to pay attention. NEW YORK (TheStreet) -- Just 45 minutes from my house by car there's a spacious and inviting Whole Foods Market (WFM. Frankly, I seldom shop there. The main reason is because there's a locally owned and operated business in my community that sells only natural and organic food and other supplies. Like WFM, that company has an abundant "bulk" department where I can scoop out just the right amount of organic bran flakes for my breakfast and organic dried tart cherries that make my eyeballs roll back in their sockets with pleasure when I eat them. Plus, my local natural-food store gives me exceptional service with caring employees. Recently I drove by what used to be an abandoned Mongolian restaurant and noticed it had been leveled and a new building was being erected. It looked spacious and had lots of convenient parking. The sign out front read "Natural Grocers opening May 29." It's right down the road from our locally owned natural-food store. A news release about Natural Grocers, which is still managed by the original founding family, is worth reading. You'll learn about the company's culture and what, in my opinion, makes it a viable form of competition to WFM's near-monopoly until now. It's been a great run for both WFM and NGVC so far. Perhaps that's why the stock market has granted both a very generous forward price-to-earnings ratio for the stock of each company. 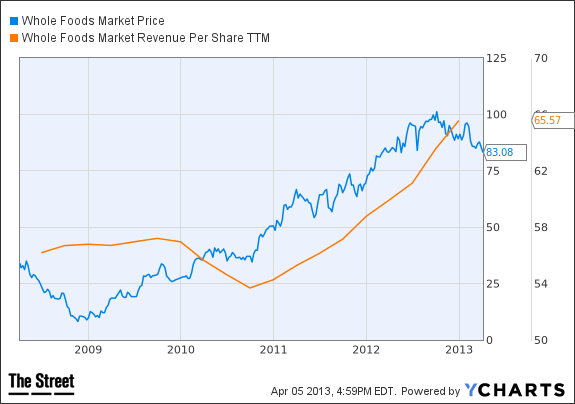 WFM, with a market cap of almost $15.4 billion, trades at nearly 25 times forward (one-year) earnings. At the moment, it's trading near its 52-week low of $81.55 and pays an 80-cent dividend. Natural Grocers, which sells only food that doesn't contain artificial ingredients such as colors, sweeteners, flavors, preservatives, hydrogenated oils or produce grown with synthetic pesticides, is growing steadily. NGVC is capitalizing on the growing awareness of the benefits of eating natural and organic foods. It's expanded into 13 states with over 65 stores. When it comes to the claim of only selling all-natural or organic foods, WFM can't quite make the same assertion. That advantage, plus NGVC's continuing execution of its growth expansion, speaks to the stock's forward PE ratio being slightly above 36. The one-year price target consensus by analysts' estimates for NGVC is around $25. It closed April 5 at $22.05 and has a market cap of nearly $494 million. 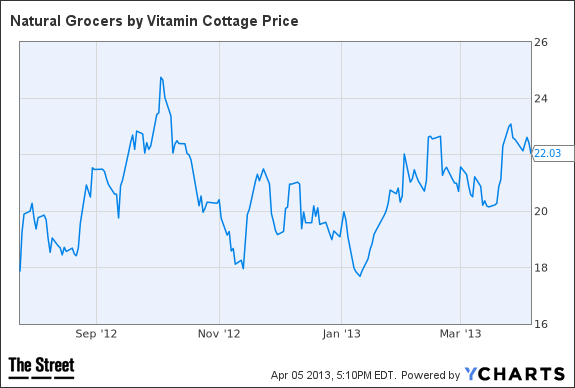 Another factor that makes Natural Grocers a vigorous competitor for WFM is that, on average, NGVC's prices are lower. From my research, I've found that prices range 7% to 10% lower at Natural Grocers than at Whole Foods. NGVC keeps the overhead and costs lower per store and then passes those savings along to its satisfied customers. That's doable when one considers that WFM stores usually have four times more square footage per store and that requires more employees per store and higher energy costs. I'm beginning to wonder if the best way for WFM to deal with this pesky, persistent competitor -- which also happens to be debt-free, thanks to its successful IPO last July -- is to acquire the company. The longer WFM waits, the higher NGVC's price will climb. It appears NGVC has the upper hand when it goes head-to-head with WFM in a local area. WFM has more variety and is better known. But can it beat NGVC's service, prices and personal touches? With a projected earnings growth rate of 30% per year or higher, its stock may have some good upside potential from here as well. As the company promises, "Natural Grocers' popularity and success can be traced back to its founding principles -- providing customers high-quality products at everyday affordable prices. Today, Natural Grocers also offers in-store nutritional support programs, free public health & wellness seminars and free access to nutritional health coaches." I know for a fact that our locally owned natural-food store is sweating about this new competitor, and I can't help but believe that WFM is feeling the same way. Keep your eyes on WFM and NGVC because the competition is just beginning to heat up. Disclosure: As of the time of publication, the author wasn't long any of companies mentioned in this article.